It’s 7am on Friday morning, I’ve driven in from Burlington to see my client Sean Canfield as we’re trying out this new time slot to see how it works. In walks Sean, half of his coffee still sits in his truck as he didn’t have a chance to finish it. He looks at me and shakes his head, questioning why he’s here at this unearthly hour. I laugh and tell him “time for Pilates”! Sean started coming to Pilates in January of 2013. He has worked with a few different instructors who helped him get to where he is today. I, personally have been working with Sean for one year and I love how dedicated he is to his Pilates regimen. It’s a love/hate relationship at times and I thought it would be great to share his story as he’s a man’s man and we love to see all men in the studio! Jocelyne: What was your first impression? Sean: I thought it was the most ridiculous thing I had ever done. Jocelyne: (Laughs) And what about now? Sean: I still think it’s the most ridiculous thing I’ve ever done, but it works. Jocelyne: Would you recommend it? Sean: Absolutely, it’s fantastic! It’s the best thing I’ve done for myself. Jocelyne: How would you describe how you feel after doing Pilates? Sean: I feel “tuned-up”. When I started coming, my body ached all the time. I had pain in my shoulders, my back and my hips. Now, I feel strong and don’t feel those aches and pains anymore. I would say I’m on the maintenance track now. Jocelyne: You’ve had multiple surgeries and you kept coming to Pilates, can you tell me a little more about this. Sean: I had two rotator cuff surgeries, one in June of 2013 and the other in September of the same year. I couldn’t lift my arms past 90 degrees and I was in excruciating pain. 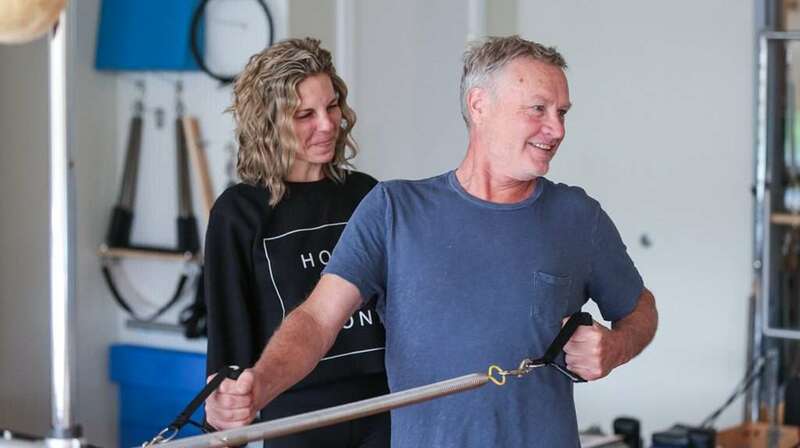 I kept coming to Pilates throughout and although there were times where I could barely move, the instructors here were always careful to help me move within a safe range of motion and were really knowledgeable about what to do to get me moving again after the surgeries. In April of 2016, I had my right hip replacement. I came back to Pilates after 4 months. Jocelyne: That’s when I started to work with you. I remember working at getting your glutes to fire, which often felt futile. There were times where you thought I was feeding you applesauce when I told you what you were “supposed to feel” and that one day you would. After working with you every week for just over a year, I’d say we’ve gotten you to gain 90% of your range of motion and strength, which is amazing in itself. Your dedication to coming every week is inspiring, considering your work schedule. I’d like to touch on that a little if you’re comfortable with that. You’ve owned a contracting company for years and are often required to lift heavy materials. How does that affect your body? Sean: To be honest, Pilates has helped me tremendously to gain strength in my core, my shoulders and my hips, to be able to carry on doing the work that I do without feeling creaky and in pain. And when I feel like my body is “sore” it usually feels better after I do Pilates. I find it addictive. Jocelyne: I’ll have to agree with you on that! Alright, we’ve covered all bases, now let’s get to the meat of this story. Pilates has truly helped your golf game, which is probably what keeps you coming back every week, truth be told (wink). Can you expand a little on this? Sean: I’ve been playing golf for about 30 years. I played for about 10 years before having kids and then I stopped for about 20 years. I started playing golf again about a year ago. I found that I have more control and power than I’ve ever had before. When I first started playing golf again, I noticed that Pilates helped me gain awareness and I started to use my core and it made such a difference. It wasn’t just the power in driving a ball, but also in putting. I’m definitely not as strong as I was 30 years ago, but I’m at my peak strength in golf. I’m hitting the ball further than I have in my whole life. Jocelyne: I’ll bet if you knew Pilates improved your golf game, you would have started before. Sean: I didn’t think Pilates could ever improve it, but I stand corrected. Jocelyne: Have you ever tried any other Pilates studio? Sean: No, but I have never felt the need to. Jocelyne: Would you recommend Body Harmonics? Jocelyne: (Laughs) Thank you Sean. I think you’re awesome and more men could take a page out of your book. I really hope this article reaches an audience that might feel that Pilates is not for them, but could feel differently after reading your story. Working with Sean is easy. He wants to work and get stronger. He doesn’t always come in feeling great as he works really hard and being in the construction industry doesn’t really understand the concept of “taking it easy” or getting others to do the heavy lifting. Keeping that in mind, we work on exercises considering where his body and mind are at and every week, he leaves feeling better. His dedication, consistency and hard work have made the difference for Sean.